East London's Pure Evil drops a new print today over on his website at 1pm Thursday 3rd May. 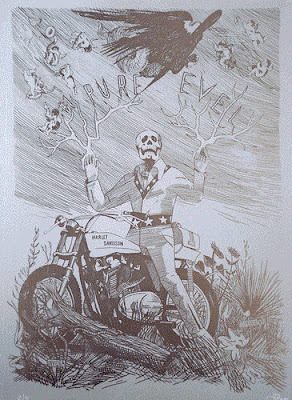 The Pure Evil Knievel Print will be released in two editions. A BLACK ON BLACK version with black gloss print on black plike 330 g/m2 paper in an edition of 60 and a DIAMOND DUST version black print with diamond dust on soft white somerset 300 g/m2 with a deckled edge in an edition of 100. According to Pure Evil , Warhol and Basquiat worked with Diamond Dust and he has tracked it down and used it in the Diamond Dust edition pictured above. Both prints will be simultaneously released on both Pure Evil's website and over at Beautiful Crime website. Check over on Pure Evil's website to see some close-up details of the prints especially the Black on Black one which looks great.